Two American cities have finally cracked one of the hardest codes in city planning: Even with low gas prices, even with population growth, even with Uber and Lyft circling 24/7, Minneapolis and Seattle have reduced the amount of driving in their cities. Average daily traffic declined 5 percent in Seattle over roughly the same period — between 2006 and 2017, according to Dongho Chang, the city’s lead traffic engineer. Believe it or not, this is a rare feat. For example, San Francisco’s vehicle miles traveled increase 13 percent between 2010 and 2016, according to city records [PDF]. The population near frequent transit is 9 percent higher, rising from 64 to 71 percent, when bike infrastructure is included in the analysis. The 9 percent increase from bike infrastructure means that 35,700 more people can reach frequent transit stops in 10 minutes or less on physically protected bike lanes. Bill Lindeke, a local urbanist writer, says he thinks it’s really walkable development that has helped Minneapolis put a lid on driving miles. Between 2010 and 2016, the area saw a surge in urban infill development. In 2016 alone, for example, there were 8,202 apartments and townhomes built in the metro region, dwarfing construction of single family homes. The average new resident in the Twin Cities region between 2010 and 2016 occupied about a third of the land as those from the previous decade, the Pioneer Press reports. Legislation, recently passed by City Council allowing triplexes in every neighborhood and eliminating all minimum parking requirements from the city’s zoning code will no doubt further the city’s densification. Minneapolis’ climate goal is to reduce total miles driven in the city by 40 percent by 2050. Seattle has succeed where a lot of other cities haven’t through a range of strategies, probably most importantly through major investment in both bus and rail transit. 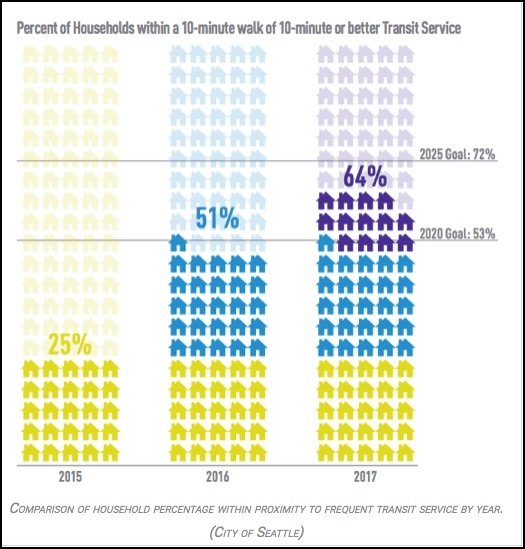 As you can see below, that helped Seattle buck a national trend in slumping bus ridership. Meanwhile, the nonprofit organization Commute Seattle has helped discourage solo car commuting downtown — which is a small area surrounded by water with limited surface street capacity. It’s worked. Only about 25 percent of Seattle’s downtown workers drive alone. And the downtown area was able to add about 45,000 new jobs without increasing car traffic. Seattle has also done a lot — but could do more — to make its streets more walkable and bike friendly. It was also named the Top Biking City in America by Bicycling Magazine in 2018. Chang says that the city is still calculating vehicle miles traveled for 2018, and it may have increased slightly, depending on whether the calculation includes highways or just city streets. I live downtown Seattle. Mass transit has increased mainly because gridlock is so bad people are taking the bus. Name a city Seattle’s size or larger where gridlock is NOT bad. Its called a CITY for a reason. Its great that at least a couple of US cities have discovered ways to develop like a city without relying so heavily on smog spewing cars. Sounds like they’re doing good work. Or would you rather see a city eat itself slowly for the sake of the free flowing automobile? Thus proving transit is better suited to downtown in the first place. 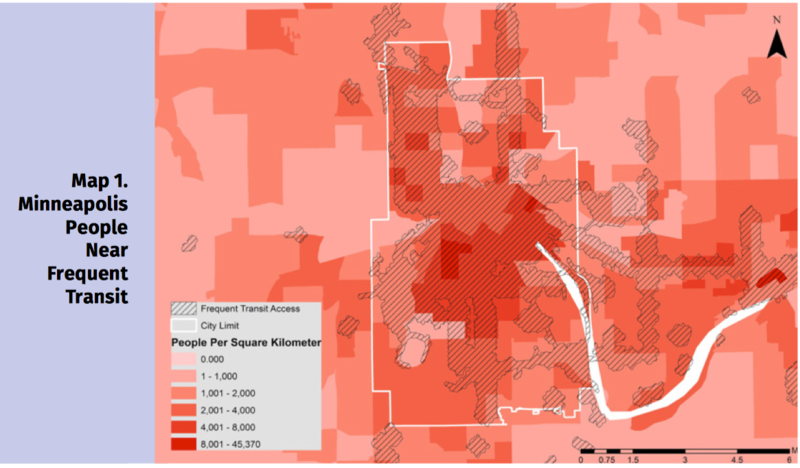 First off, VMT for Minneapolis hasn’t declined. Here are the VMT numbers from MnDOT. Second, bike commuting is about 4% of travel in Minneapolis. In terms of VMT, it has virtually no impact of VMT. Third, triplexes are low density, not high density housing. Triplexes are not going to help create density. What has been happening in Minneapolis is a focus of higher density housing in downtown and around the University, making real, walkable environments in those locations. Unfortunately the new comprehensive plan undermines this. Richard, I would much rather drive in St. Paul than in Minneapolis. And do. All of these things sound good to me. I think you can measure the success of a cities transportation reforms by how angry they make car focused people like you. With respect to Denver, Minneapolis is a good comparison and used a 10-year window from 2007-2017. Looking at Denver RTD ridership from 2008-2018, bus ridership was up 12% and rail transit was up 95% with total ridership up 31% so obviously the problem doesn’t lie with rail transit. The ‘slump’ in RTD ridership is with buses from 2014 til now. A confused driver is a slow and alert driver. A slow and alert driver is a safe driver. With your “logic” a confused driver is a safe driver. Yeah, sure. Hardly a holy grail or sustainable. re: Seattle…just wait until the tech boom forces more folks to live outside of the city in more affordable areas where transit is lacking. What this one-sided site lacks is objectivity and, therefore, fails to acknowledge that bikes, peds, transit and, yes even cars, need to co-exist. How that formula changes depends on how committed cities and developers are with respect to the complete picture. Have we learned lessons from the Robert Moses era which focused 100 percent on the automakers profits? I hope so because I firmly believe that all modes can co-exist. 2,436,129,162 (2017) < 2,466,491,657 (2016) ? I wonder how many people rode the bus that Minneapolis-St. Paul’s Green line replaced? Was the previous bus ridership anywhere near the stated 37,000 LRT one? You could add Uber and Lyft to the mix. Have you thought about including the many slow drivers concentrating on texting rather than focusing their eyes on the road ahead whilst behind the wheel? Sure is but it’s NOT less than 2,400,983,870. But if you’re suggesting the trend has been down since 2013 I’d agree. You can get a lot of density out of multiplexes. Paris gets a phenomenal amount of density without highrises. How does the comprehensive plan undermine walkability? Eliminating single family zoning and parking minimums is probably the single best thing they could have done. 4% bike mode share is significant, especially for an american city in the midwest. Considering we are talking about a 3% drop from peak VMT, it’s not unreasonable to give some credit to biking mode share. 2017 to 2013 is 75 million fewer miles, that’s a good trend for a growing mid-sized city and it really bucks the trend for the US overall, especially with gas prices so cheap. Road features such as wider lanes, straighter roads, and wide clear shoulders, do make drivers feel more comfortable. Comfortable enough to drive a bit above the speed limit, or to look down at their phone and read that text that came in, instead of focusing on the road. Roads with these features are statistically more dangerous. I’d guess the 2010 figures are artificially depressed. High unemployment in the aftermath of the financial crisis means fewer people going to work. It was about 15,000 beforehand – so a definite increase. Minneapolis and St. Paul has an awful lot of suburb to suburb commuting traffic that isn’t well-served by public transit. Currently I-494 is over-capacity and suffering serious congestion with several several plans to deal with the congestion incrementally. This Star Tribune piece claims that a fair number of companies have moved out of both downtown areas to the suburbs. 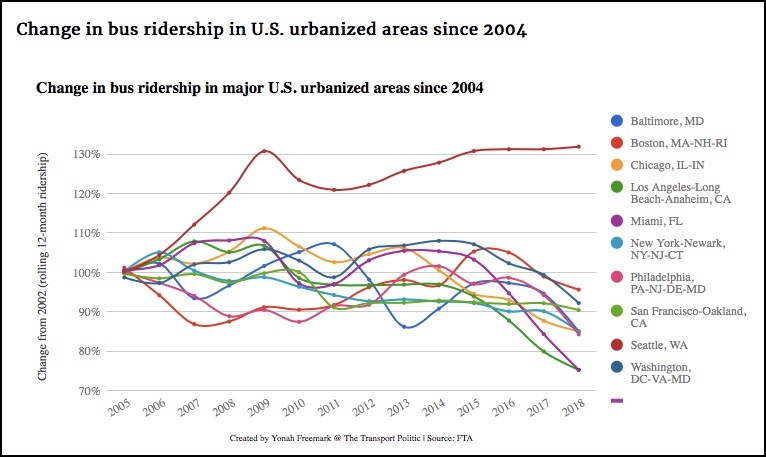 .Maybe that is among the reasons that Minneapolis VMT is falling?